I recently posted this adorable conversation my twins were having while eating their pizza. Twin A: This is the same as Mommy’s. Twin B: No, Mommy’s is better. Twin A: It’s the same ingredients. Twin B: Mommy’s secret ingredient. While every word was true, there was so much behind the conversation that did not come through. Missing was the fight that had just happened because one child was getting special treatment that the others were not. Missing was the tantrum that proceeded the “pizza for breakfast” indulgence. Missing was the guilt and frustration of hurt feelings all around. It’s so easy to look through our social media feeds and think that everyone is living these perfect lives – filled with love, adorable children, and nights out with friends. And even though our brains know that this is not true – even though we have personally witnessed our friends’ messy lives – our hearts still believe these single moments of perfection, captured in between fights, and tears, and loneliness. 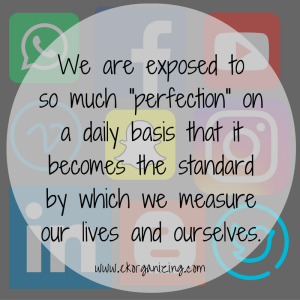 We are exposed to so much “perfection” on a daily basis that this becomes the standard by which we measure our lives and ourselves. There is no way that someone else’s kids could possible fight as much as mine do. No other mother could possibly yell as often as I do. No one else is eating junk food before bed, while lamenting the ten pounds that still need to be lost. Everyone else has smiling family photos, with colour co-ordinated outfits. Everyone else has calm conversations while their child is screaming the walls down. Everyone else is better, nicer, calmer, healthier, happier. They must be – just look at their social media posts. We know this is a lie. We. Know. It. And yet, we allow it to colour everything we do, and the comparisons we make to our own lives are turning us into self-doubting, insecure messes. Right before my kids had this delicious conversation that made my heart explode, there were three people crying, one person sprawled on the floor in full tantrum mode, and one guilt-filled mother angrily scrubbing counters to avoid dealing with it all. Pizza for breakfast. Best mom ever! Subscribe below and be the first to receive the latest blog post straight to your inbox.